BusinessWeek profiles the horrific conditions in Indonesian tin mines, where largely destitute miners extract ore with shovels and picks. Only a few hours earlier, Johidi had been working with two older men in a deep tin pit along a mud road a couple of miles behind the village. The pit began to cave in, the commander says, using the Indonesian word longsor—"landslide." The two older miners bolted away from the cascading mud, while Johidi, apparently confused, ran toward it, the commander says. It took three hours, about 50 villagers, and two excavators to uncover Johidi’s body from beneath 16 feet of dirt. When their search was finished, rescue party members mounted their motorbikes or climbed into the few vehicles parked on the edge of the mining site. Under a tropical downpour, they formed a long procession and streamed toward the village along the wet road. Up front was a black Suzuki flatbed truck carrying Johidi in the back, cradled in the arms of a villager. 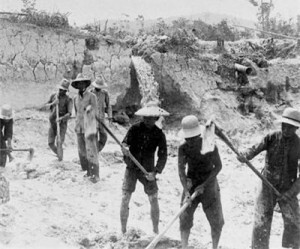 Tin miners on Bangka Island from the 1940s from Tropenmuseum.